Some acne treatment systems focus on treating acne from the inside out. Other acne treatment systems focus on treating acne from the outside in. Zenmed offers products that can be applied to the skin to open pores and reverse discoloration of the skin, as well as products that replenish healthy bacteria in the digestive tract and fight inflammation. Let’s take a look at some of Zenmed’s top selling products. Zenmed Dermacleanse is a good product for getting rid of blackheads, but it does have ingredients which can cause irritation for those with sensitive skin. Zenmed is an ethical company that offers its products with a 60-day guarantee. Zenmed Dermacleanse is a good product for getting rid of blackheads and brown skin blemishes on oily, acne-prone skin. It has too many botanical ingredients for use by people who have sensitive skin. Zenmed Facial Cleansing Gel contains botanicals that can cause allergies in about 30% of users. 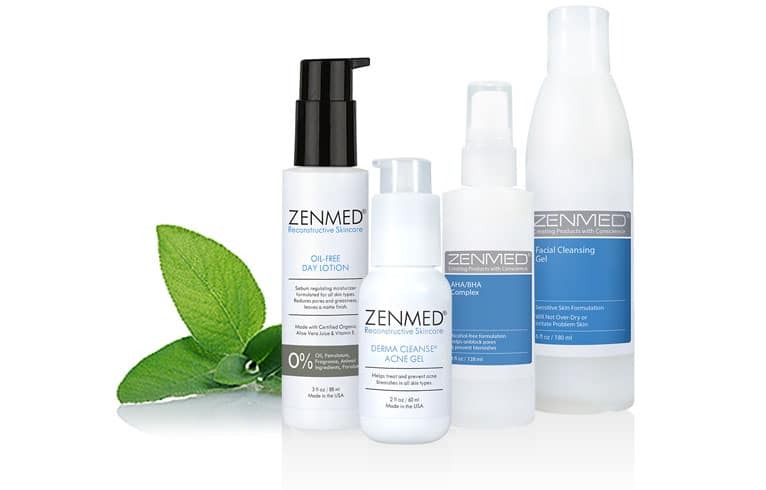 Zenmed Acne Scar Treatment Kit can relieve scars—and also cause new irritation and inflammation of the skin. Don’t use it if you are allergic to parabens. Zenmed’s treatments for rosacea tend to get better results if your underlying problem is an infection. But you’d get still better results just by treating the infection. For mild to moderate common acne, Exposed Skin Care is more effective, less expensive, and comes with a better money-back guarantee. Lots of acne products contain alpha- and beta-hydroxy acids intended to exfoliate the skin. Stripping away particles of dried skin that are “glued” to the surface of pores along with oxidized, black, unsightly skin oils opens pores and begins the healing process for whiteheads and blackheads. It also stimulates the production of collagen beneath the skin that fills in shallow scars, fine lines, and small wrinkles. The problem with most acne products that list alpha- and beta-hydroxy acids is that they contain the wrong acid, or the right acid in the wrong concentration, or the right acid at the wrong pH. Zenmed Dermacleanse exfoliates the skin with 2% salicylic acid at a pH of 3.5—the right acid at the right concentration and the right pH for opening clogged pores. Any product that has a pH of 3.5 can cause a little stinging and tingling of the skin. When you are using an exfoliant, stinging and tingling—although not burning and itching—are a sign the product is working. Just don’t leave it on your skin if the feeling is uncomfortable. That is a sign the product is working “too hard” and can damage your skin. Zenmed Dermacleanse works especially well for oily skin acne. If you have dry, sensitive skin, then the witch hazel extract and chlorhexidine might be a little too much—and if you have dry, sensitive skin, you are probably better off using a product made with glycolic acid rather than salicylic acid. Zenmed’s Dermacleanse is great for oily skin and possibly problematic for sensitive skin. Zenmed’s “Gentle” Facial Cleansing Gel might be OK if you have oily, non-sensitive skin but it’s a definite no-no if you have rosacea, eczema, contact dermatitis, or you just tend to break out when you put chemicals on your skin. The problem with the Gentle Facial Cleansing Gel is that it contains a number of botanicals that can trigger allergic reactions in about 20% to 30% of the population. These include balsam tolu, which sometimes triggers severe allergic reactions, yarrow, which can trigger allergies in people who are allergic to ragweed, geranium oil, which can cause itching and irritation, essential oil of lavender, which works by breaking down the skin (great for burns, awful for acne), and essential oil of tangerine, which smells good but can make the skin feel itchy. Zenmed’s Acne Scar Treatment Kit contains the cleanser described above plus a microdermabrasion complex that uses kaolin, montmorillonite, and ground walnut shells to rub off the topmost cells in the epidermis of the skin and encourage younger skin to come to the surface. The microdermabrasion complex also contains a number of botanical ingredients, some of which are helpful for your skin and some of which can harm it, as well as methyl and propyl parabens as stabilizers. Many users of the microdermabrasion cream report that it really does help fill in small acne scars. More users of the microdermabrasion cream report that it makes them break out, especially when it is used in conjunction with the “Gentle” Facial Cleansing Gel. It’s possible that this product would make small acne scars look better, but it is more likely to make your face break out with tiny new pimples. Zenmed’s Skin Eraser is intended to be used to remove the reminders of acne after it has healed, the brown spots and scars that are especially noticeable on brown or Asian skin. The instructions say to spread a fine layer of Skin Eraser on the skin every morning and then to use sun protection when going out. Skin Eraser really doesn’t erase anything. It is a moisturizer. It will help bring out the depth of colors in natural skin tones, and this makes scars and brown spots less noticeable. There is nothing this product can do for your skin, however, that you can’t do with a much less expensive moisturizer. Zenmed’s Support Serum promises to relieve redness caused by rosacea quickly. Since rosacea is not a skin condition caused by clogged or inflamed pores, the ingredients in this Support Serum are not targeted at healing pores. But they are not likely to relieve redness, either. In fact, the ylang ylang, lime oil, and geranium oil in this product may sometimes cause a rosacea breakout, especially in users who are sensitive to perfumes and fragrances. When rosacea is caused by a stomach infection with the the bacteria that also cause ulcers or a skin infection with tiny Demodex mites, this product may help. But faster results can be obtained by treating the stomach infection or the skin mites. The much more expensive Skin Support System for treating rosacea and dry skin gets mixed results. Some users say their skin feels better although redness does not improve. Other users report that the skin support system, like the support serum, makes the skin break out. Zenmed also sells an anti-redness mask for rosacea. It’s included in several kits for treating rosacea and it is available for sale by itself. The anti-redness mask contains aloe, chamomile, and kelp, which relieve sensitivity of the skin. Like most treatments for acne, some people get great results from using it and others do not get any results at all, but there are no ingredients in this product that can harm the skin—which is something that cannot be said of most acne products on the market. Zenmed is known for ethical treatment of its customers. You won’t be rebilled month after month. Zenmed believes that its products work well enough that you will order them when you want them. And Zenmed products come with a 60-day guarantee. For treating blackheads, whiteheads, and pimples, however, most people get better results from Exposed Skin Care.